hello, I'm using your tool for sending forms, and there are many complaints that pepole are sending form and we don't receive them. the box of the submitions is two-thirds empty. but when I am tring to send a form it sendig it well. what is the problem? do I need to be conected to the acuont to receive forms? 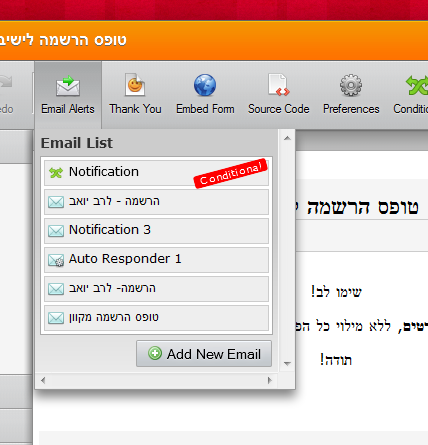 Your form have a lot of notification email setup on it. Can you please tell us which among them is not working properly? There is also one which uses conditioned email, -- were you able to establish this as working? May I suggest that we try restart the notification emails, and add them one by one only. You can delete them and just create one at a time, then test if its working. Then just add another after making the previous one work. Use this guide also on how to setup the email notifications properly. Please inform us if you continue to have problem after trying my suggestion. Thanks alot for the respond! I did what you asked me to do. but I didn't make my self clear (bad english).. The problem is that sometimes (alot recently) we are not getting at all the form that is send to as, even to the "Inbox" of our accunt. Based on what you just said it sounds like you are speaking of the Email Notification that is sent to you each time a form is filled out and submitted to you to show that you recieved a submission? Could you please confirm whether this is what you meant or if it is something else then could you elaborate some more? I'm sorry I wasn't clear. the problem is that some of the people that are filling out the form, and sending it to us, and evreything seems OK, but we are not getting anything, even to the Inbox of the accunt.